Most of the attention given to the social location space goes to check-in services like Foursquare and review services like Yelp, but there are some great games based around location that you can go out and play today. Here are five of the best. Currently in beta, Tourality is a game that requires to you travel to specific locations faster than other players. Currently available as an app for Android, Blackberry and Nokia handsets (with an iPhone app to follow), it can be played anywhere in the world. 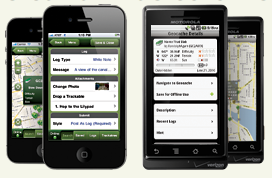 A range of different challenges are available, from races and trails to a frantic Rush mode. One-on-one and team vs team games can be played. If the game can’t find any other players for you nearby, you can still play on your own in single player mode and gameplay areas are automatically generated based on your current location. There are all manner of gaming elements to uncover as you play, from ‘gadgets’ that give you additional advantages to ‘Goodie spots’ where you could uncover either gold to spend on gadgets or a thief who wants to steal your gold. 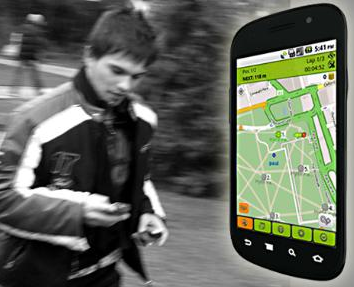 Cult phenomenon Geocaching sees you hunting down real objects hidden by players at locations all over the world. We published an introduction to the game earlier this year. In its ten-year history, over 3 million participants have hidden and searched for almost a million items around the globe. When you find a hidden container (a “geocache”) you might even find items left by other players who have visited that location before. 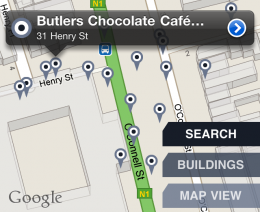 You can play the game with any GPS-enabled device using information from the website, and there are iPhone and Android apps to help you too. If you have an adventurous spirit and a slightly geeky side, Geochaching could well be for you. If you’d prefer to stay in the house to get your geo-gaming fix, FoursqWAR is a a battle strategy game that’s built on top of the Foursquare API. This iPhone game sees players compete to reach the top of a leaderboard by ‘attacking’ and ‘defending’ different Foursquare locations. As you play you can build up your forces and defend your turf with humvees, a mortar team, bomb technicians and even John Rambo himself. As we said in our recent review, the amount of fun you get from FoursqWAR really depends on how many players there are in the local area. However, the game’s developers are working to improve it further and if you can get a few friends involved, it could well become an obsession as you battle to reach the top of the leaderboard. Want to add a gaming element to your driving? Social driving service Waze isn’t a game at its core, it’s a way of sharing information with other drivers about conditions on the road. Traffic jam ahead? The idea is that Waze will tell you, thanks to other users publishing automated information based on their speed and location over time. However, in order to encourage users to contribute additional data to the service, Waze has added items called ‘Road Goodies‘ onto its map. 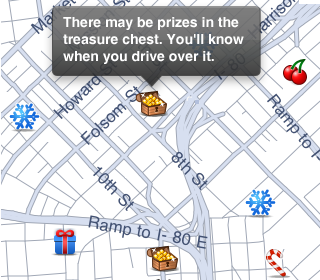 By traveling out of your way to drive over items like candy canes and snowflakes you can earn points. While these points aren’t, on their own, much of an incentive, they’re a fun way of improving the service for other users in your area. 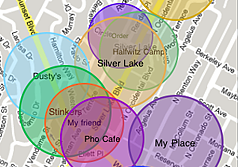 Who knows, you might discover some interesting new parts of town along the way. A little like FoursqWAR, Turf Wars sees you battling for real world territory against other players. However, this game has a crime theme and involves taking part in missions, evading the cops, and build up a Mafia mob. The aim is to gain ‘turf’ in your local area in order to gain income for your crime syndicate. You can tool up with virtual weapons to take on rivals, invite friends to join your mob and take part in missions to increase your experience levels. In hotly contested areas, the game can get quite frantic but we recommend starting by setting up some turf in a quiet, mob-free area in order to level up before you take on tougher players. Read next: VLC for Android Coming "In A Matter Of Weeks"